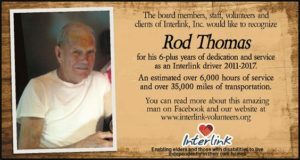 Remembering Rod – Interlink, Inc. Previous StoryVote Daily for Interlink! 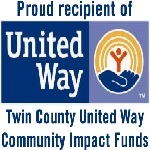 “As the executive director of Interlink for several years, volunteer Rod Thomas showed a wonderful give of service to many of our care receivers. When he found out what music you liked, he made of point of having it playing in his car during the transport. Rod was the consummate gentleman, exemplary polite. He was on time, every time, for a transport, and spent many hours in the car waiting for the person’s appointment to be over, usually reading scripture or a meditation. An easy smile. Rod drove every weekday for Interlink, consistently telling me we gave him a purpose in life. I came to depend on Rod to see Interlink through the occasional “very-busy-how-are-we-to-get-all-these-rides-done” times. God bless you, Rod Thomas.